which forms the whole North-Eastern sea-board of Japan . to either crash back at the office OR walk a long~ way home . had the major exhibition center of Tokyo Big Site to close AND cancel all upcoming conventions . employees as well as visitors will NOT have ample transportation to come to AND from the exhibition site . because Tokyo and its Southern cities like Nagoya AND Osaka enjoy warm seasons with mostly NO snow . and sea village and farmers with such rural dialects telling of horrific experience AND lost between families is hard to bear for viewers . surviors tell of tsunami hitting 20~30 minutes after quake, and most witness the highest wave at 3~4 stories high on surrounding buildings . 3.12 Saturday : subsequent quakes continues here and there 4, 5, 6 .. TV reporting by colored regions on map . felt in the Capital of Tokyo and even in Osaka, Japan’s second city much further down South-West . although some cut-back are NOT executed if electricity is deem sufficient on-the-spot . those where-abouts currently unaccounted for : 2400 people ..
most of the city still water at automobile-tire level ..
currently 430,000 evacuees in shelters with 1691 known dead, AND over 10,000 residents where-abouts unknown ..
reports abound on rescuers discovering 20, 40, .. 200 dead bodies in a town ..
answer : water, blanket, gasoline to run errands AND information on their families ..
are urged to stay put – for gasoline AND food shortage once on site . – I do NOT think I could be this sain at this age in such circumstance ..
add to this : it starts snowing in this devastated area where rescued people need warmth ..
all-the-while after-quakes in M4~5 continues at random, even felt in the Capital of Tokyo ..
beginning with Plant 1 and then 3 followed by 2 and today 4, the whole Fukushima Daichi Nuclear Plant is in danger . as well as the major media is under-estimating the possible outcome in their very own Sci-Fi Otaku hopes of solutions ! live coverage that shred my tears ..
and teachers handing out diplomas in tears ..
and was reminiscent of the radio Surrender announcement by his father 66 years ago ending WWII . God it IS the Crown Emperor but instead of in awe, people simply returned to their surviving chores ..
headed into subway stations to begin collecting funds to support the evacuees ..
God this is depressing . in the area effected by Nuclear leak ..
in between TV programs just like they use to place commercial advertisements . skipping the evident fact this exposure is more-over constant . collected record at the end of the day on numbers at evacuation centers totalled still an unbelieveable 340,000 people . to the tune of those Kamikaze suicide pilots who vainly tried to save what was left of WWII on the Pacific Theatre ..
3.17 Thursday – is there any end to this ? geez What’s NEXT ? seismic activity seems to be increasing around Shizuoka-ken which is right about Mount Fuji, a sleeping volcano AND the long-time symbol of Japan in traditional art as well as modern travel posters . so eventually this could come as another try of Kamikaze suicide missions ..
where the heck is Ultra-man AND all the Sci-Fi Heroes ? Japanese head slashes out “this is Japanese problem” on their own TV broadcast ..
and the US is rendering evacuation to military dependents as well . plus multi-lingually watching live updates in Japan as well as States-side coverage . denying all and as steady from Day-1 deeming in control of all . NOT to mention the obviously Kamikaze-minded suicidal 50 or so left on the Plant site plus the helicopter pilots AND water-hose truck drivers . in tune with ground police thrusting demonstration-intended water hoses to cool the heating Power Plants . hinting these may still be the erroneously bold people who started deadly war campaigns to conquer the resources around the Pacific Rim . so there still are mighty scary people behind all the Toyotas AND Sonys . when they should be airing imminent missions to stop the lurking danger of meltdown ..
hinting this is NOT effective OR they may be strategizing the next alternative including the inevitable final solution of burying it all . [ Water-Pumping Onto Reactors 1, 3 and 4 ] all-the-while, WoW : the things human brain is capable of devising in desperate times . with a large-battery ‘Super Pump Truck’ support in the rear with 300 meter hose to gush out 3 tons of water in an hour . it will be left alone to spray-on 7 hours continuously WITHOUT any human operater in the vicinity ! until they measure temperature lowering ..
add to this an incredible machine used in Chernobyl, is now being hovered onto the site, resembling a tall medieval siege weapons used to demolish defending castles which acts as a huge crane with a long hose on a 20 meter folding arm to thrust water down – this is better than water-canons OR helicopters for the target can be pin-pointed . just short of exclaiming the Otaku-cultured Japanese have done it .. this is made in Germany originally intended to pour raw concrete onto high structures .when this starts going into action you will see a working St.Louis Arch on the dire site possibly on Reactor 4 . [ On with-standing Reactor 2 ] attempts to reconnect electricity since the building is intact thus cannot pour water onto to cool . [ Reactor 5 and 6 ] power has been restored with cooling reinstated for Reactor 5 AND a second cooling assisting on Reactor 6 .
and now come warnings on foods produced around the effected area . announcement this afternoon that milk and spinach produced in ibaraki – much South of contained Plant – measured yesterday afternoon radiation over the safety limits . scary BUT this is a precautionary measure so drinking it for a month still won’t kill you . after over-night pumping of water several improvements seen . electricity to Reactors 1 AND 2 has been recovered by linking cables . and after attempts of pouring sea water amounting to 2000 tons radiations levels are decreasing . and contemplating to insert water onto Reactor 4 from this morning . two repetitive water-pouring methods above may be working as I will introduce the trucks in a new Post . a couple of the workers came back for a Press conference after work AND radioation check but says they were all right ..
despite being IN direct vicinity of the damaged Plants ? and Updated as on my initial Sendai EarthQuake AND Tsunami Post linked above ..
of which field Japan has long been researching . as a successful result Reactor 3 was getting better with radiation levels decreasing this morning BUT is rising again over noon . might be a leak, still . therefore : they are about to release radioactive gas formed within to keep it from exploding yes, they HAVE to do this ..
coming to the point of this Post, as the air will bring released particles to surrounding regions . – by “They” I mean the responsible person in charge of the organization in control of that specific situation, in this case spokesperson for Tokyo Electric Power Company . one town just across Fukushima Daiichi Nuclear Power Plant : Futabamachi . because of its obvious inhabitable locale the whole evacuated residents of roughly 4000 people where relocated to Saitama a suburb of Tokyo . 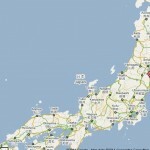 of which has already happened around Fukushima Daiichi Nuclear Power Plant immediately following explosion . and an aftershock amounting to 5.7 reported in the vicinity . news of grey smoke from the problematic Reactor 3 possibly from explosion mid-afternoon . for the sheer weight of fall might render more damage to the Plants . even the less-damaged AND now-recovered Reactors 5 & 6 in concern for the local community . after all is done, there will be the lasting problem of radiation flowed into the sea ..
and once in Tokyo it is raining -_- and to continue for a few days . where although electricity HAS been restored the water cooling system is NOT working yet . 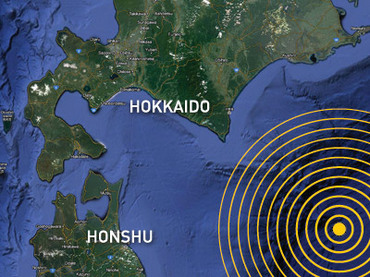 M6.3 earthquake occured today 4:19pm off the shores of Fukushima and felt M4 in the Capital of Tokyo . and rescue workers sent from abroad are being recalled including the States, UK, Australia, NZ, Russia and South Korea for concerns of radiation . as the day closes good news that power is in ALL 6 Plants . Amen . Plant temperatures has lowered from continuous pouring of water and those that splashed back onto the sea is spreading radiation . and much increase amount of radiation is found in surrounding waters . increased radion is observed in surrounding Niigata-ken, Saitama-ken, Chiba-ken, Yamanashi-ken, Kanagawa-ken AND Tokyo-ken ..
many regions sound familiar in this second group because they are the satellite residence of moderate-income workers who commute to the Capital of Tokyo with an hour’s access by train or subway . sadly the days are over when one of the joys of visiting Tokyo was to go at 5 am dawn onto Tsukiji Fish Market – just before crossing over to the artificial Wonder island of Odaiba – where you can lust on ‘Today’s Morning Special’ Sushi Set of freshest Raw Fish just caught . radiation fuel contained in Reactor 1 is heating up and is currently the most problematic than Reators 2 OR 3 .
temperature yesterday passed above 400C Celcius and is maintained by influx of sea water BUT pressure is mounting THUS may have to release steam . again, this will release radiation particles into the air . over the acceptable dose for babies at 100 Bq/1kg. some major newspapers in cordination with Japan Nuclear Safety Group calculates the danger zone instigated by the government or Tokyo Electric Power Company is unrealistic in that weather as well as human AND material movement does NOT extend in a necessarily circular boundary, thus now larger areas should be alerted even 50km North-West AND South-West direction rather than the currently imposed 30km circumpherance around Fukushima Daiichi Nuclear Power Plant . one has shown levels that can increase cancer risk 100 mSv – accumulation equivalent to what he/she would be exposed while working in the plant for 10 years. situation stabiling at the price of more news of casualty . of the 3 workers at Reactor 3, 2 have been transfer to a hospital from outer injuries . they were re-connecting electric cable with legs in water and reports of 170 mSv the highest so far . and may already have begun OR will result in melt-down . (evening update) OK I got it : they found unusual radiation amounts in Reactor 3 Turbine Room underground floor . this could have resulted from salt that has accumulated onto the rods after seawater evaporated . you know they have been splashing in enormous amount of seawater as an emergency measure directly from nearby ocean – in desperation – thus now in a relatively more controled situation, they have instead opted to bring water from a dam . but other Reactors 1 and 2 might be in similar case ..
to support this “cleaner” pumping two American barges containing 2,000,000 liters of fresh water left Tokyo bay . as vague the announcement is, households still around the effected area are having problems surviving from lack of daily amenities including food AND water for transportation personnel are reluctant to go into the area . OK stack up for the long- haul folks . Japan cannot solve this problem on its own and is seeking international aid . 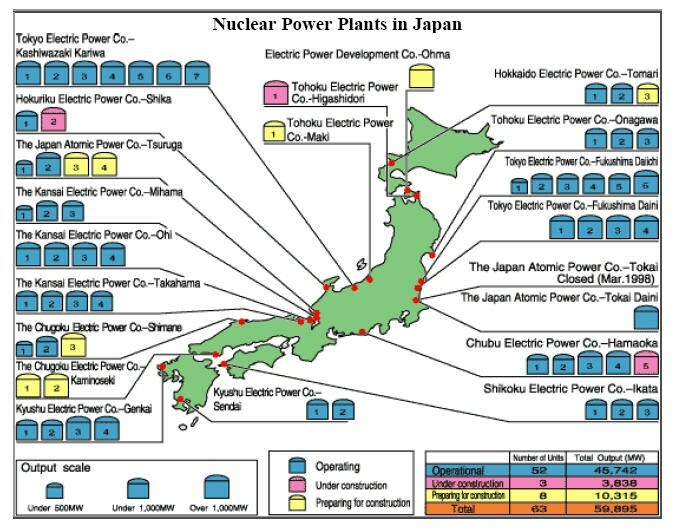 lest we can send in an ill-fated Kamikaze team OR intelligent robot ..
one positive fact is that electricity has been recovered in the Main Control Room of ALL Plants (although I still have to check whether Fukushima has ‘MCR’ on each Reactor OR 1 for each 2 of which a total of 6 Reactors consist Fukushima Daiichi Nuclear Power Plant – “Daiichi stands for First, thus Daini meaning Second site laying a bit to the South). NOT to say all cooling fuctions are operating, still : meaning they can deduct the source AND monitor current states although NOT being able to pin-point without human visual verification . so think 3 years, to actually fix this problem AND then 30 years for the uninvited effect to linger on . there is bound to be planning centers in all regions mentioned on this Post’s topic with precise updates AND action . so this is going to effect how half the World lives from now on . imminent catastrophy will be contained with international help for this is their live-case scenario which could very well happen in their country too . but everybody will learn to live differently . Japan located off-shore cliding-inter-continental-plates knew there was going to be a /big/ one coming but make-believe NOT in our life-time . still personally I don’t think this was the BIG one for the highest wave was 4-stories high at immediate earthquake coastal buildings . miniature robot roamers as the ones appearing on last year’s Academy Awards Oscar winner movie ‘Hurt Locker’. I presume these remote-controlled machines as part of US Nuclear Response Team can SEE (which current situation forbids for danger of high-radiation) AND extract samples of surrounding air AND soil BUT may NOT be able to actually fix and repair conplicated tasks . – a surer option that dumping from the air as in Chernobyl for the weight can do more damage to crack leaks BUT dangerous for human controllers to approach . following my Post of March 16th where a child of a worker remaining IN the doomed Reactor asked for compassion to know that their parent/s were told to ‘be ready’ (in Japanese .. of upcoming death) a mother of a 32 year-old worker part of the 300 working in shifts of 50 to control the Reactors made an anonymous inverview with US press media – oh no, NOT Japanese press . she told that her son said all the workers currently inside the Plant know they will die some in weeks and some months ..
announcing Nature ever-still has a hold on us : M5.1 earthquake hit Akita-ken 2 hours ago AND also today M3 in Aomori-ken both immediately North of Miyagi-ken (main city : Sendai). ‘ken’ is how Japan is geographically divided into prefectures . [ April 2nd Saturday ] radiation leaking into the ocean ever since March 11th for three weeks ..
that you now click on “Britney Sued for 10 Million” news before onto latest updates from Fukushima ..
but still have to find the source for without it simply trying to cover the crack may very well re-route leakage to other passage OR even over-flow . at last count March 30th radiation on Fukushima Plant oceanfront was 3,000 times the normal level . and because the government is immediately concerned with this disastrous assignment the remaining residents AND evacuated are much in loss AND frustrated . lot of old fishermen AND farmers in the area divastated for virtually any future sales has lost hope for fear of radiation . 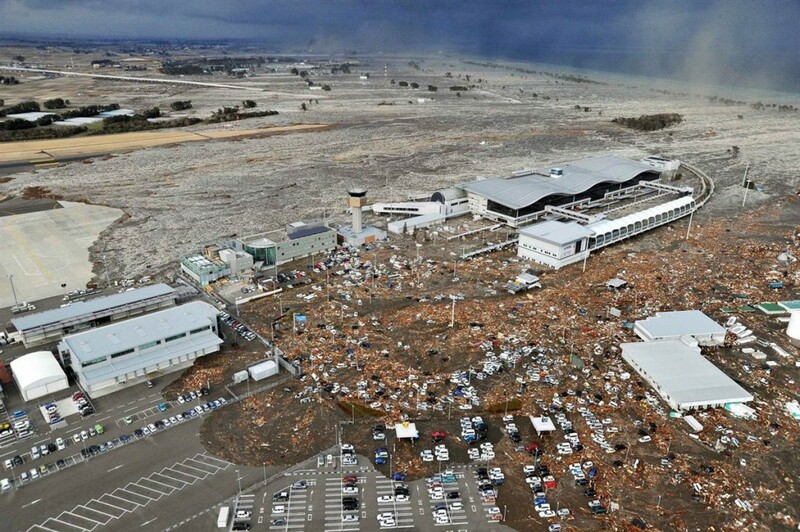 and as sea water recedes from tsunami-effected area a massive operation is under way to find the dead as possible survivors comprised of 100 helicopters 65 ships 25000 personnel . though when it lowered a rescue worker the dog fled into the remaining house still underneath . the helicopter ran out of fuel had to return but a relayed ship near by came to rescue the dog in a few hours, safe wouf wouf ! [ April 4th Monday ] Soft Cover-Up AND Suction Amarda ? cover the damaged nuclear power plant buildings with a special fabric AND retrieve contaminated water with tanker ships ..
all the while a M7.1 earthquake hit off indonesia shores today with tsunami alert soon after retrieved . [ April 5th Tuesday ] something very scary is happening today . I mean the earthquake AND tsunami all nature’s calling, but this time man intentionally, although seemingly without choice is going to dump TONS of radioactive water onto surrounding seas . TEPCO Tokyo Electric Power Company with the approval of the Japanese government will pour almost 11,500 tons of contaminated water to make room to store for more highly contaminated water . to dissipate radiation flowing as a result of this pouring .. to an extent, it seems Russia is sending their “floating Radiation Treatment Plant” Suzuran used to neutralize decomissioned nuclear submarines ported at Vladisvostok North of Japan . efforts to contain the crack mentioned earlier with concrete, sawdust, newpaper .. have failed . 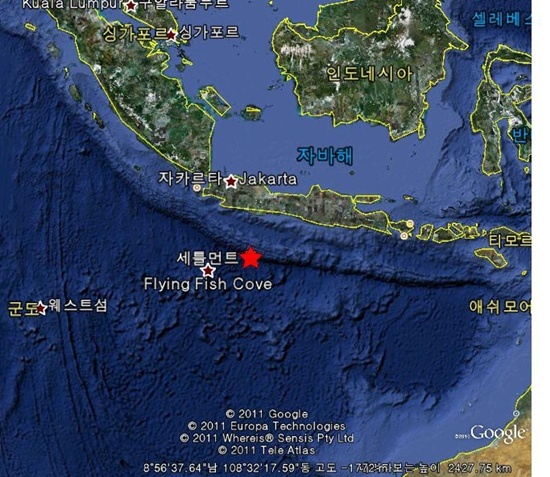 ( March 14th Wednesday 2012 Update ) Recurring EarthQuakes and Tsunami ..
another earthquake of 6.8 Magnitude struck today 10 km deep, further NorthEast of the original earthquake now a year past . 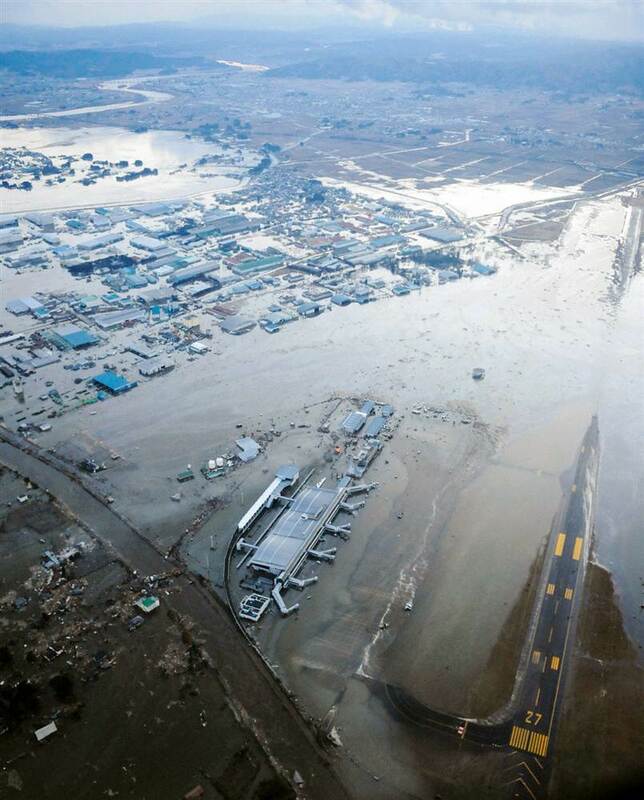 a tsunami warning was cast only to be cancelled after only a low tide hit the shores of Aomori . 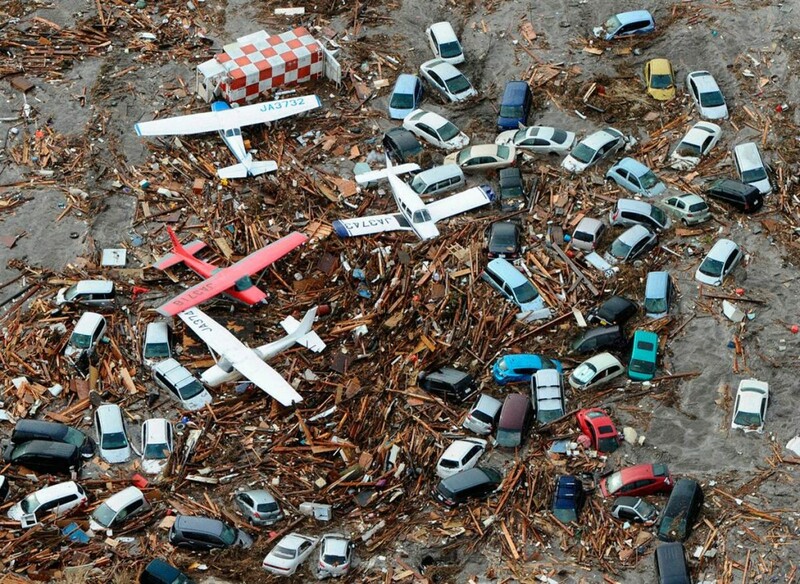 it was a grim year for Japan and its industry with more somber news and conspiracy theories . TEPCO Tokyo Electric Power Company had to somehow manage freezing Winter sea-water . and the Japanese government is draining efforts to re-stabilize the effected Sendai area, which had it not been for the disaster would be forgotten and barren as it has more so been, in a chilly region not as extreme as Northern Hokaido yet the elders remain to make living in their old way . 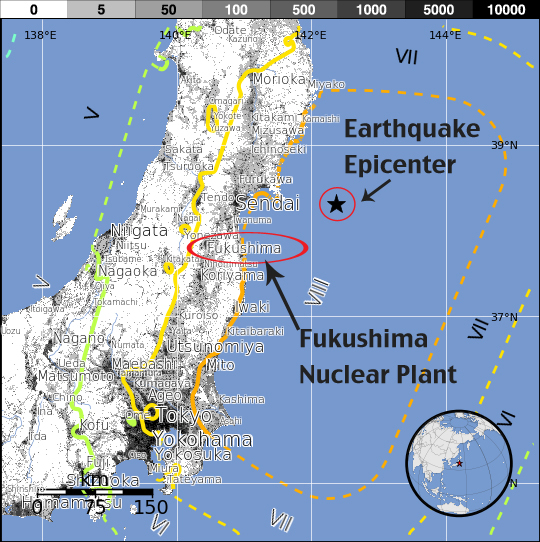 ( August 8th 2013 Update ) as if to accentuate how scary Nuclear Power is : over TWO years from this disaster, measures are being instigated to reduce – mind-you NOT stop – radiation flowing into the sea ..